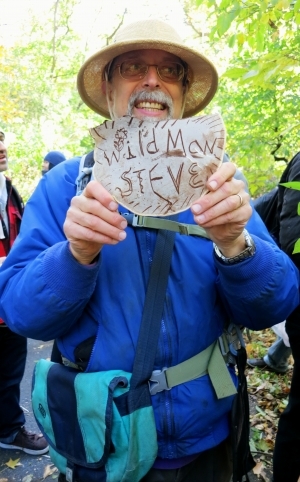 In honor of the harvest season, here is my experience foraging with Wildman Steve Brill. Steve conducts tours all over the tri-state area including some right here in Fairfield County. For more information on upcoming tour dates and locations, visit wildmanstevebrill.com. I’m sure at some point, most people I know have had a meal in one of New York City’s parks – be it Central, Bryant or McCarren. But I’m willing to assume that far less have consumed a meal made from one of the parks. That all changed for me last weekend. Before Walter & I went to The Blaze, we headed down to Prospect Park in the unfamiliar territory of South Brooklyn (thanks G train) to go on a foraging tour. I heard about these types of tours from my friend Liza’s blog and wanted to see what it was all about. Daily Candy had a 2 for 1 special a few months ago, and that was all the reason I needed. Armed with our backpacks, shovels and some plastic bags, we arrived at Grand Army Plaza at 11:45am and waited for our guide, Wildman Steve. After giving us a brief history of his background (he’s been conducting foraging tours for almost 30 years now), off we went into the park. Our first find also happened to be my favorite of the day, a wild green called Lamb’s-Quarters. A European relative of spinach and beets, it’s even more flavorful and healthy, and makes a delicious salad. As we walked further into the park, we spotted something called a Kentucky coffee tree. Steve told us that he uses its pods to make a (decaf) coffee and sometimes in baking. It’s no secret that I like my coffee with a kick in the morning, so although I love the thought of locally grown coffee, I think I’ll stick to this. Some other wild edibles we found were carrots (which are white, not orange), goutweed (which tasted like carrots), onion grass, herbal tea leaves and persimmons. The most interesting find during the tour was a Szechuan peppercorn tree. The red berries (peppercorns) are edible. The peppercorns were spicy and had an almost jalapeno-like flavor, but be forewarned – they leave a pretty lasting burning sensation that numbs your mouth. Originally I thought, given the season, we would find lots of wild mushrooms scattered around the park. Sadly, the snow storm from the week prior killed most of them off. What we did find were a few non-edible mushrooms called Artist’s mushrooms – which can be drawn on like paper with just a twig, or whatever you can find around. I didn’t find one myself, but I was impressed with one of our tour-mate’s Wildman sign.